Happy Friday! I hope you all are doing something exciting. Even if you're not (like me) I hope you enjoy the break! The husband and I have been working hard lately so we're really looking forward to sleep, being indoors and taking it easy. What are your plans? After yesterday's post about feelin' messy, I jazzed up with some bling. Sometimes, a gal just needs to feel fancy. 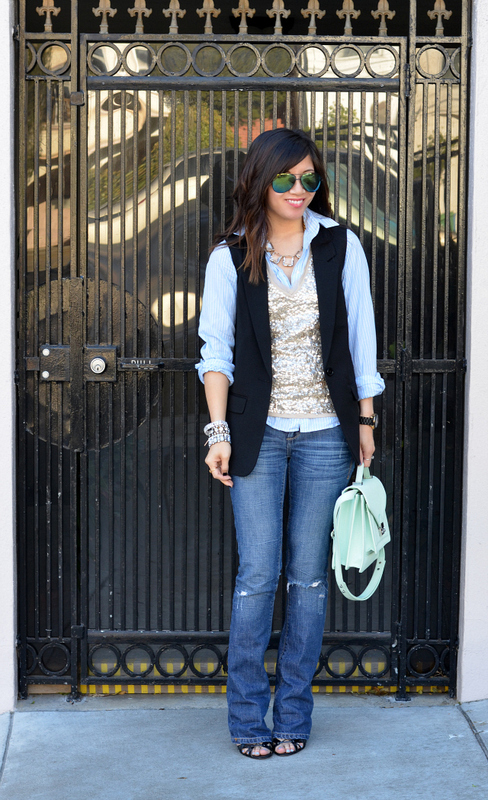 Love that sequined top! I saw that in a magazine a few years ago and have dreamed about it ever since. I got a cheapo version at Forever 21 and, even though it's not the J. Crew version that I dreamed of, I still love it. Looks great! Love the spring layering you did here!!! especially the sparkle! 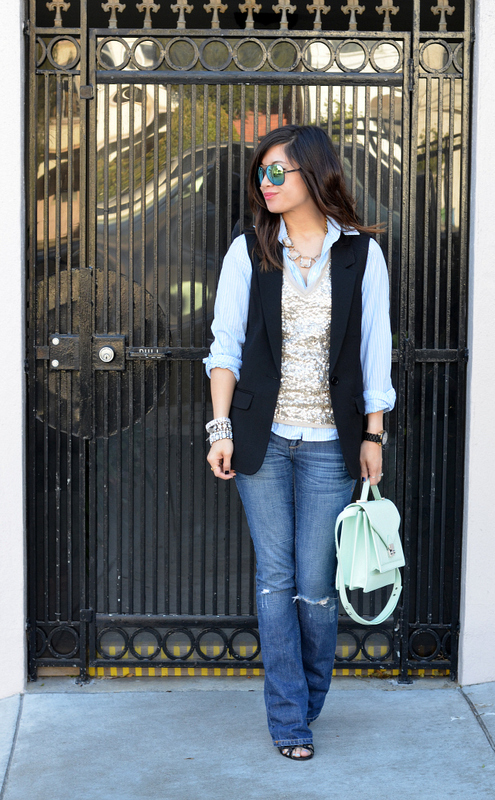 in love with your sequin vest!! super cute! LOVE the sequins. This is so cute and chic! This is a really exciting look for "taking it easy" :D But you look so great. I like this chic elements in combination with simple items. 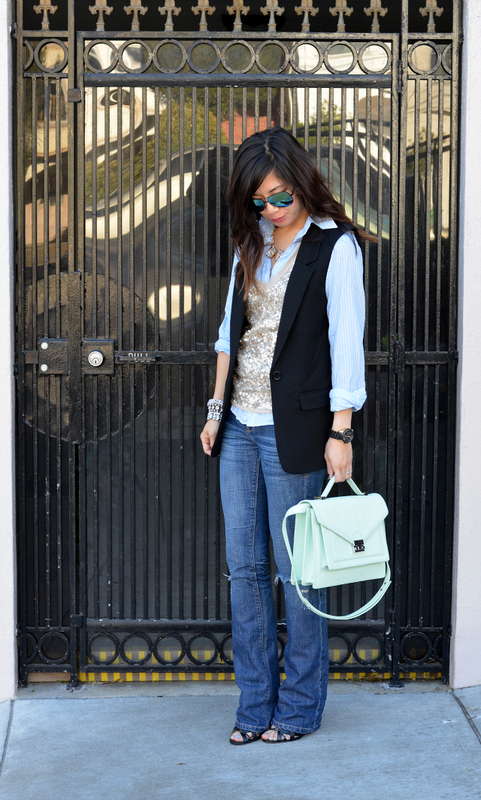 Loving your mint bag and those sequins! Um can I marry this outfit? 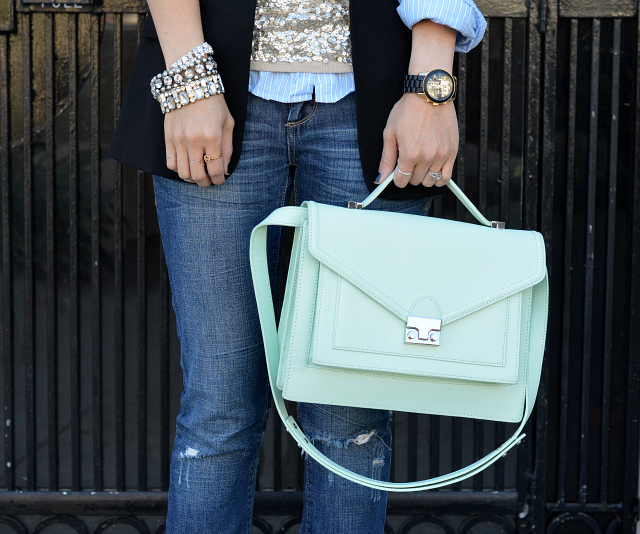 I love the gold sequins with the mint bag :) Great layering too! Have a great weekend Nancy! Love your sequined top and sparkly bracelets. Looks awesome against that denim and mint bag. Love Love Love this outfit Nancy! Love the bling to the day outfit! Have a great weekend. I love the sparkle, it really takes this outfit to the next level. Such a perfect bag too. So lovely pics and look... amazing bag.. I lov it! Check out my last blog post... and what do you think... do you wanna follow each other? Love the shiny top and the bag. I did a lot yesterday so today I'm taking it easy too. You look so beautiful! Love the sparkling bits and mint tones .. CUTE! You look amazing hun, love the touch of sequins you added to this chic look, is adds such pizazz. Gorgeous outfit! I love the top and your handbag! 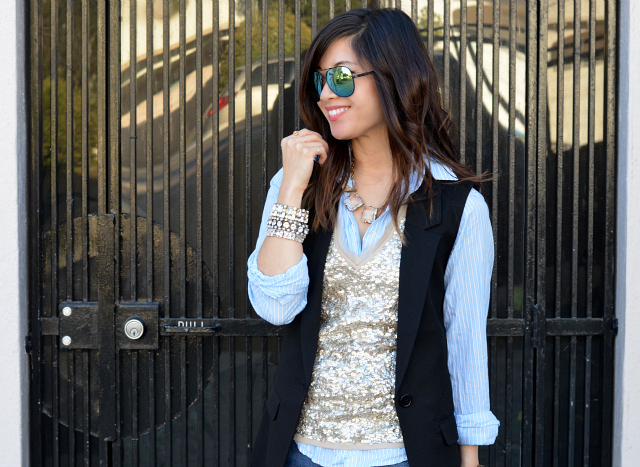 I LOVE the combo of sparkle and menswear-inspired pieces. So chic! That minty bag is perfection - love it! I totally missed the memo that ripped jeans are back and I am ALL ABOUT the return. Way to mix things up!